The prompt for this month’s story was “in the headquarters of the Moon NAZIs…” which…yeah. I went ahead with it as a challenge to myself to see what I could do with it. Being that I wasn’t exactly a fan of Iron Sky (it started off as campy and tongue-in-cheek, but quickly became painfully unwatchable within its first thirty minutes) I wasn’t too confident in what I could with said prompt. But, I decided to focus on the fact that we still don’t know a lot about what living for extended periods of time in microgravity will do to the human body and went from there. So, I give you “The Last Contingent”. 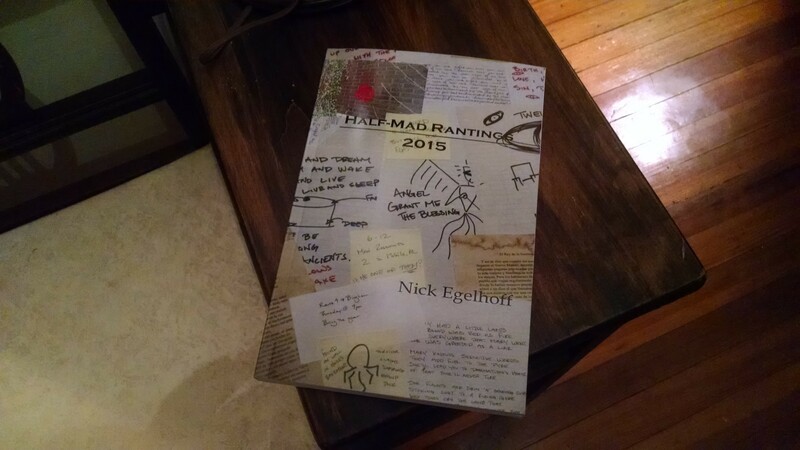 Due to some editing snafus it’s a little later than I’d hoped (I got a proof copy last week and found some errors that I’d missed when going through the file), but Half-Mad Rantings: 2015 is finally available. It has all thirteen stories published here last year plus four new ones: “Confluens”, “The Duke”, “In Through the Back Door”, and “Mystery Hill”. Those four all take place in the Ninth Age setting, which will be the trend for any extra stories in the yearly collection for the foreseeable future. I’m still hard at work on the stories for this year (the next one will be published this Friday) and already ahead of the game to one degree or another. So, here’s to hoping for 2016 to shape up even better than 2015!